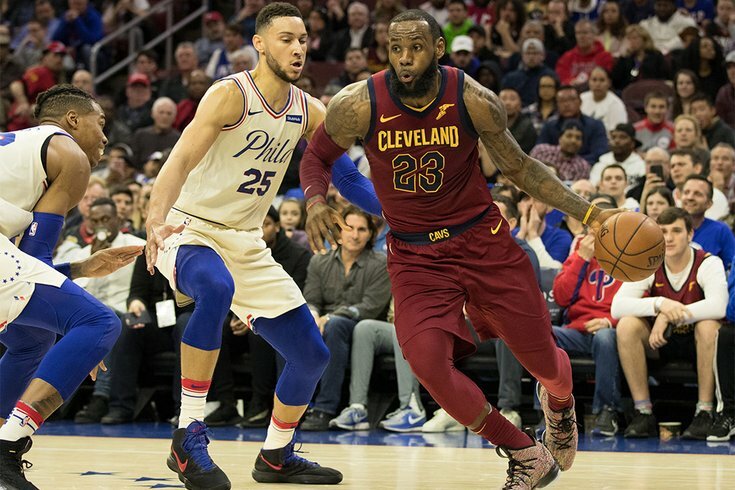 Cleveland Cavaliers forward LeBron James (23) dribbles past Philadelphia 76ers guard Ben Simmons (25) during the third quarter of an April 6 game at Wells Fargo Center. Usually by this point in the NBA season, Sixers fans are already discussing the team's prospects for free agency and praying about ping pong balls. It's a different story tonight as the Sixers start their Eastern Conference semifinals series against the Celtics in Boston. Philadelphia could well be a championship contender with its current roster. Former Sixer Charles Barkley made an appearance Monday morning on 97.5 The Fanatic, joining Anthony Gargano and Bob Cooney to discuss the NBA playoffs and the Sixers' outlook moving forward. There's been a ton of buzz in recent months that the Sixers, who are flush with cap space, will make a serious push to sign LeBron James away from Cleveland. Barkley doesn't think it will happen and doesn't believe it's a good idea, anyway. "Well, not LeBron," Barkley said. "LeBron won't fit with the Sixers because, you know, that takes the ball out of Ben's hands." Since Simmons functions as an unconventional point man, Gargano said it should be obvious that LeBron would play off the ball. Barkley argued LeBron's style makes that impossible and will ultimately reduce the talent around him. "He can't do that," Barkley said. "When you watch Cleveland play, one of the weaknesses of their team [is] he's got those other guys paralyzed out there because they don't do anything when he's in the game. They just stand around and let him go one-on-one. So that wouldn't work with the Sixers in any form, shape or capacity. He needs shooters and Ben's not a shooter. You wouldn't be taking advantage of your talent." That's one way of looking at it. Another way is to acknowledge that LeBron is entering the later part of his career and might not want to play the role of a savior anymore. The Sixers can excel already with several different styles of play depending on the lineups they present. LeBron joining Philly simply adds a huge piece to their repertoire and resembles more of what James did in Miami, but with a different configuration of skills. For the time being, it's all speculation. The Sixers and Cavaliers are both still alive this year. They may even face each other. It's also important to recognize that Charles Barkley has no fear of being wrong. He'll say what he thinks even if he knows it's going to come back to him. Remember, a jump-shooting team like the Warriors can't win an NBA championship.